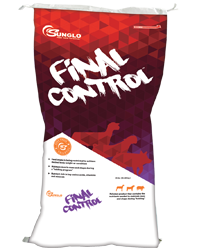 A unique “Top Dress” product designed for use with Sunglo® formulated show feeds when total feed intake is being restricted to achieve. Always provide access to fresh, clean water. Check weight gains at set time intervals and adjust daily feeding rate as needed until target weight is reached. Always transition slowly from one ration to another to help avoid digestive upset. Feed 1 to 2 lbs. per head per day along with the amount of regular show feed needed to achieve the desired weight when restricting.